The IPS Officers Association in West Bengal on Tuesday expressed its shock and dismay over injuries sustained by several police officers in the state including an IPS officer who lost his right hand in a bomb attack at Raniganj on Monday. 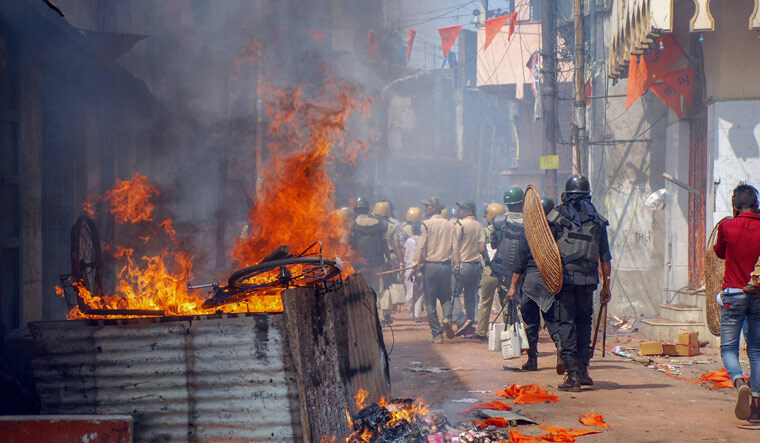 The officer was seriously injured on the second day of Ram Navami processions led by BJP and Trinamool Congress and other Hindu organisations like VHP, Bajrang Dal, Hindu Sena and Hindu Sanmhati. The IPS Officers Association on Tuesday issued a note that stated, “It pains to see this (the injuries of IPS officer) and the tough situation that police faces. Asansol-Durgapur deputy commissioner of police and IPS officer Arindam Dutta was severely injured and lost his right hand in abhorrent violence on Monday. We wish for his speedy recovery and full restoration of his hand,” said the note. This is not the first attack against police in West Bengal. But this is the first time the IPS Officers Association has brought out such a statement, which shows police officers' inability to contain the situation in West Bengal. Meanwhile, the Vishwa Hindu Parishad on Monday criticised Chief Minister Mamata Banerjee for allegedly turning a 'blind eye' to the well-being of Hindus in West Bengal and asked her not to continue with her 'appeasement' policy. Bansal alleged Hindus were attacked by Trinamool Congress members during Ram Navami celebrations. “Despite attacks on the Bengali Hindus, Mamata has the temerity to ask whether Ram used to carry guns and swords. VHP challenges Mamata Banerjee to ask same questions to Paigambar Mohammad during Muharram. Does she have the guts to do that?” Bansal declared. The West Bengal chief minister, during an administrative meeting on Monday, asked the police to slap arms cases against the BJP and other Hindu leaders. The statement of the VHP portends a confrontation of Hindu rightwing groups with Banerjee in the coming days. But IPS officers feel that in the midst of this confrontation, they would be the casualties again, like Arindam Dutta.